1) Access controls have been placed on all outside doors along with a secondary set of doors on the interior of our main entrance to create a lobby or holding area before guests can access the rest of the school. 2) Security cameras have been added in strategic and high traffic areas. We also have video cameras installed on every school bus. 3) Flat Rock has a full-time School Resource Officer (SRO). Anderson District Three has teamed with the Iva Police Department to place the most qualified and best fit SROs throughout the schools in our district. Flat Rock's SRO is Officer Zeke Gerrard. Officer Gerrard was a police officer for four years with the Anderson City Police Department before coming to our school in 2014. 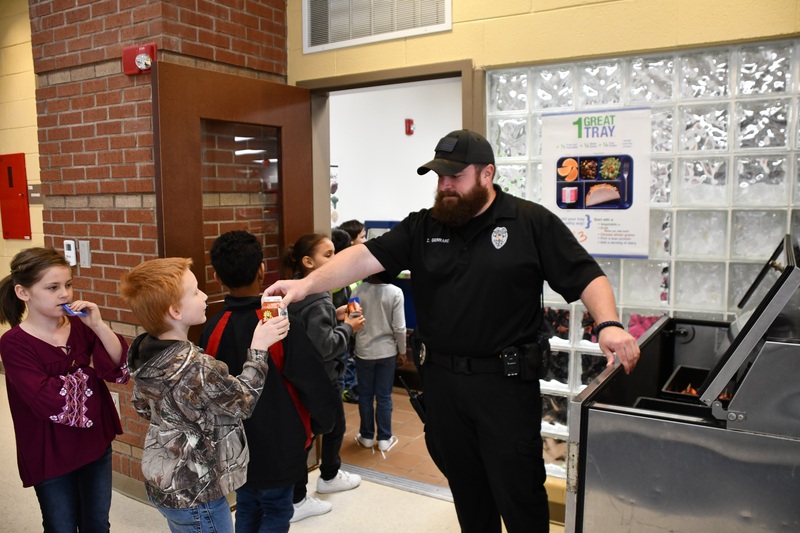 Officer Gerrard works daily to ensure the school grounds are secure, students arrive and dismiss safely, visits with students and their families during home visits, and oversees the day-to-day security of staff and students at Flat Rock. Officer Gerrard always has a smiling face and works hard to ensure he interacts with all of the students in our building. He is a welcome addition to our school!